We’re going to be starting Align Your Story on April 26th!! I’m very much looking forward to sharing the course with you! 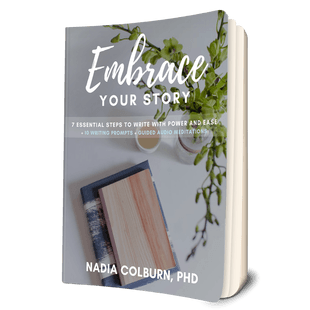 I’m Nadia Colburn, and I’m so delighted to work with you in Align Your Story! It’s going to be a great journey together! One thing you’ll find about this practice is that some days go smoothly, some days less so. That is part of the practice. Don’t get attached to outcomes. Just keep going! Not all days are great writing days. But some are. And they call can be good experiences, even if challenging. I hope you enjoy this practice. Be as realistic or as whimsical as you wish–and let the prompt take your attention to different places each day (or come back to the same place, if you wish).